Description and Definition of Whips: Whips are instruments for driving horses or other animals, or for correction, consisting usually of a lash attached to a handle, or of a handle and lash so combined as to form a flexible rod. Horse Whips: Horse whips were commonly used by the Great Plains tribes of Native Americans to goad their horses on during battles or during the chase for buffalo. Punishment Whips: Whips were used as a weapon of punishment within tribal societies by the Whip Man or by the Native Indians whose task was to 'police' the tribes, who were called the "akicita"
Whips required minimal natural resources or technology to construct. The three types of whips used by the Native Americans, the horse whips, punishment whips and ceremonial whips were constructed using similar designs but the ceremonial whips were decorated with much greater care using carvings or paints to depict special symbols and occasionally embellished with feathers. Making a handle for Whips: The handle was made using a hard wood or different types of bone or horn including the elk horn. The hardened woods used to make the handle included hickory, juniper, oak, cedar, maple, ash, walnut and birch. Ceremonial whips were made as part of the regalia of a warrior. These whips were decorated with symbolic colorings and markings which were significant to the owner. These ceremonial whips were symbols of power and carried into battle for their protective power. A Ceremonial whip is used by the head organiser of a Pow-Wow who is referred to as the Whip Man. The Whip Man is responsible for making sure dancers are dancing during the Pow-Wow. The Whip Man carries a small braided whip he uses to point at flagging dancers. The role of the Whip Man holds considerable responsibility and this ominous title probably dates back to the first roles of the Whip Man - that of the punisher. 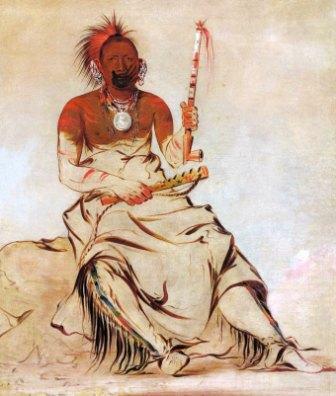 The Whip Man was an official and respected position in many Native American tribes. His status was similar to that of a Medicine Man but his role was to impose punishments where this was necessary. Native Americans were very lenient to their children but should their behaviour warrant it the Whip Man was called who might use a willow switch to punish children. In this role he was also respected for his skills as a teacher who would teach children right from wrong. Whip Man were also appointed to undertake the task of punishing adult offenders within a tribe. The instrument of punishment for theft were whips. The number of lashes administered by the Whip Man ranged from fifty lashes for the first offence, one hundred lashes for the second and death by the rifle for the third offence. The American Indian Akicita were the Warriors and Elders who had considerable powers in policing and organizing the tribes. The Akicita had the authority to impose punishment. The punishments included the destruction of the culprit's personal property and corporal punishment administered by use of the whip.